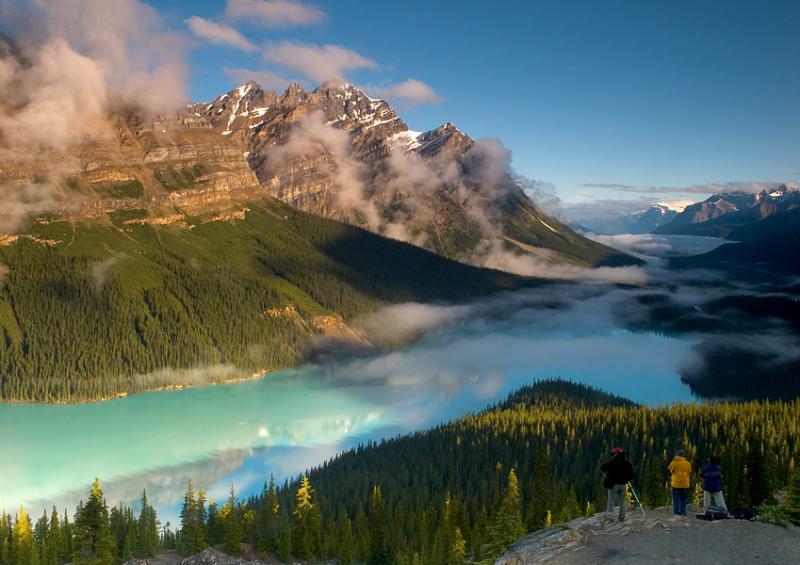 These photographers have gathered to capture the sunrise and changing morning light on Peyto Lake. Notice the different colors of the lake based on the light. Peyto Lake, high above the Bow Summit along the Rocky Mountain Trench, is fed by the runoff from the Peyto Glacier which gives it the magnificent blue colour. Located between Lake Louise and Jasper on the Icefields Parkway. Like I said in 06, this one still kills me. Stunning photo. Wow, Gary. Spectacular! Love the clouds and fog. This one still kills me. Absolutely stunning. Damn shame I can't vote again. This is just fantastic, you are brilliant! I was here in the middle of the day, last year at sunset, but certainly did not get ashot like this, well done! How could I not vote for this. Absolutely beautiful. Stunning shot!!! Great use of the two graduated filters. WOW!!! This is really awesome! I can't get over the water color! Just a sensational shot, Gary. The hanging morning clouds really give this an otherworldly effect. Got my vote. inclusion of the many other photographers. This is so beautiful that it brings tears to my eyes. I really have to resist the urge to book a plane ticket. WOW Gary, this is absolutely stunning, beautiful view and wonderful lighting, got a vote from me! You images are just about as spectacular as being there in person! I spent a few hours on the web planning our trip!! So we will hit Glacier Park Montana first, then head to Banff....OMG I can't wait!!! Another beauty, Gary. I think this is my favorite of your Banff series so far. Excellent work! wow, very nice place. this is breathtaking. Wonderful! Great mist on the water. Another beauty Gary. The contrast of light and shade is quite effective, thanks to the lighter cloud/mist to blend the other areas together.